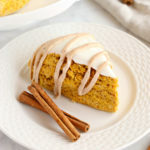 These Best Ever Starbucks Pumpkin Scones are everyone's favourite fall treat for pumpkin season! And they taste even better than Starbucks' Pumpkin Scones! Preheat your oven to 375 degrees Fahrenheit and prepare a large baking sheet by lining it with parchment paper. In a medium bowl, combine the pumpkin puree, egg and whipping cream with a fork. Set aside. In a separate bowl, combine the flour, sugar, baking powder, salt, cinnamon, nutmeg, allspice, ginger, and cloves with a wire whisk. Cut the cold butter into cubes and add to the flour mixture. Using your hands, pick up a handful of the flour mixture and butter cubes and rub your hands together only once before dropping the mixture back into the bowl. Repeat this process until all the butter has turned into thin sheets distributed throughout the flour mixture. Pour the pumpkin mixture into the flour and butter mixture and mix together with a rubber spatula gently until it's mixed about half way. Dump the half-mixed dough onto a floured work surface. Using your hands, pick up half the dough and fold it over the other half. Continue working the dough in this folding motion, very gently, until almost all the flour is incorporated. As you do this, slowly create a round shape about 2 inches thick. Slice the round dough into 8 triangular pieces and place them on the prepared baking sheet. Bake for about 20-22 minutes at 375 degrees Fahrenheit, or until the scones have puffed up slightly and are firm to the touch. If the scones start to brown on top, remove them from the oven so they don't over-bake. Let the scones cool on the pan for a few minutes, and then transfer to a cooling rack to cool completely. While the scones are cooling, make the glaze by combining the powdered sugar and whipping cream in a medium bowl. Add the powdered sugar first and whisk while adding the whipping cream one tablespoon at a time until a thick glaze forms. Divide the glaze into 2 separate bowls. Leave one bowl aside (this will be the white glaze) and to the second bowl add the cinnamon, cloves and nutmeg and whisk to combine (this will be the spice glaze). When the scones are cool, dip them upside down into the white glaze until the glaze coats the top of the scones. Set on a plate or cooling rack and let the glaze dry for about 5 minutes. Add the spice glaze to a small piping bag or ziploc bag and snip off the end. Pipe the spice glaze on top of the white glaze to create a lined pattern, or any pattern you wish. Discard any remaining glaze and allow the scones to sit for about 15 minutes before enjoying, so the glaze can harden just slightly. Store in an airtight container for up to 2 days, or enjoy them while they're fresh for best results!